ROUND ROCK, TX — For the fourth time in his last five outings, right-hander Casey Kelly pitched seven innings and allowed one run or fewer. 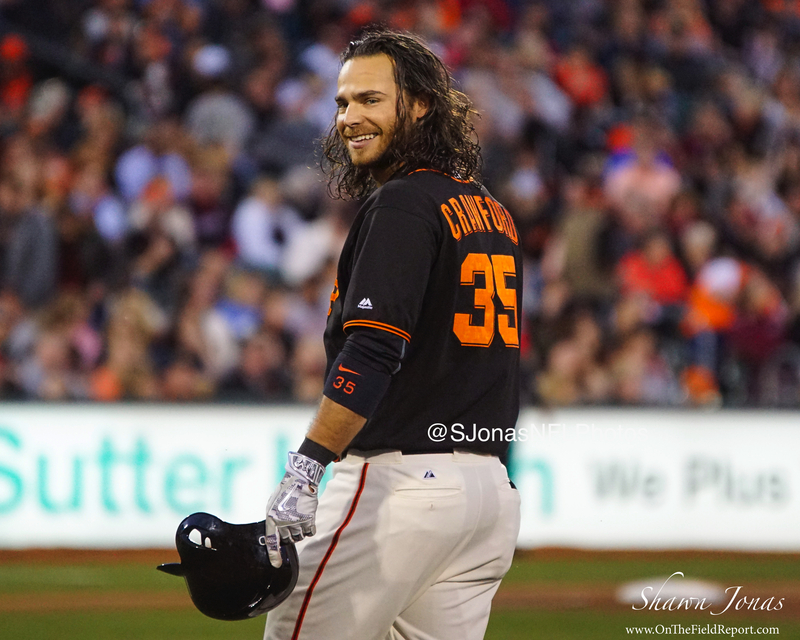 On Thursday night in Texas, however, it went for naught as three former Giants farmhands led a late-inning comeback to push the Round Rock Express (30-36) over the Sacramento River Cats (32-35) 6-5 in 10 innings. Kelly struck out eight to come within one of his season high, which he set on May 29 at home while facing Albuquerque. The one earned run over seven frames lowered Kelly’s season ERA to 4.77. The number sat as high as 11.29 through five starts, but allowing just six runs over his last 34 innings has helped to decrease that figure drastically. Sacramento was trailing 1-0 in the fourth when outfielder Chris Shaw’s 12th home run of the year cleared the right-field fence. He would end up finishing the night reaching base a total of three times, adding a double and a walk, as well. Infielders Ryder Jones and Orlando Calixte also recorded two hits, with Jones driving in two of the team’s five runs. But when right-hander Jose Valdez entered in the bottom of the ninth for the River Cats, things began to unravel, and all at the hands of former teammates. Express shortstop Nick Noonan, drafted by San Francisco out of high school in 2007, launched a three-run homer to cut the deficit to one. Then it was Tommy Joseph, drafted by the Giants in 2009 and shipped to Philadelphia for Hunter Pence in 2012, who tied the game with a single with two down in the ninth. And lastly, Round Rock walked off to Hunter Cole’s RBI single an inning later. Cole was a 26th-round pick by the Giants in 2014 out of the University of Georgia and was the player-to-be-named-later when the San Francisco acquired right-hander Sam Dyson from the Texas Rangers. San Francisco Giants right-hander Jeff Samardzjia (0-0, No ERA) will make a rehab start for the River Cats Friday night as the club will look to win their fourth road series of the season. The Express will counter with former River Cat left-hander Michael Roth (2-0, 3.24). First pitch is set for 5:05 p.m. (PT). Catch all of the action live online at rivercats.com, on theMiLB First Pitch app, and on the air on Money 105.FM beginning at 7:00 p.m. (PT). 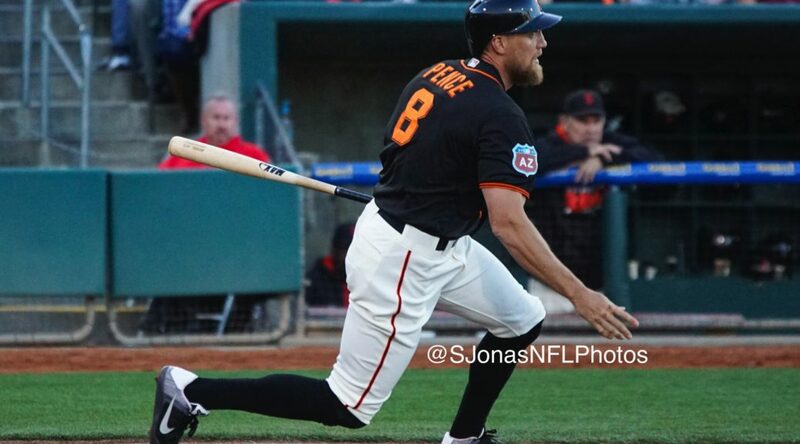 WEST SACRAMENTO, CA – San Francisco Giants outfielder and fan-favorite Hunter Pence is expected to join the Sacramento River Cats this weekend on a rehab assignment for a sprained right thumb. While he is expected to join the team for Friday night’s game, his rehab schedule has not yet been confirmed. Pence hurt his right thumb on April 3 while diving to make a play in a game against the Seattle Mariners at AT&T Park. The veteran outfielder had been playing through the injury, but was ultimately placed on the 10-day disabled list on April 20. Pence has played in 17 games so far this season. The 35-year-old joined the San Francisco Giants in July of 2012 via a trade with the Philadelphia Phillies. In his first two full seasons with the Giants, Pence played in 324 consecutive games. He is a three-time All-Star (2009, 2011, 2014) and two-time World Champion (2012, 2014). Pence has played with the River Cats in two of the last three seasons, also on rehab assignments. Combined between 2015 and 2016, he has played a total of 13 games, hitting .366 (15-for-41) with five home runs and 12 RBI. First pitch for tomorrow night’s game at Raley Field against the Reno Aces is set for 7:05 p.m. with gates at 6 p.m. Tickets are still available for tomorrow and the rest of the weekend. For more information, please call 916.371.HITS (4487) or visit rivercats.com. 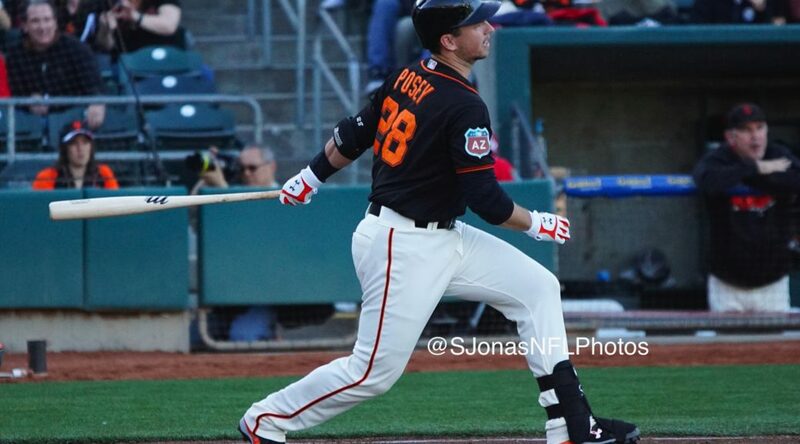 West Sacramento, CA – The best offense in the Pacific Coast League took the field Saturday night and then looked on as the Sacramento River Cats (45-56) ran up the score early en route to a 12-0 win over the El Paso Chihuahuas (57-42). Sacramento struck for nine runs in the first two innings and coasted to the win behind an excellent combination effort from the bullpen. Sacramento’s five-run first inning followed last night’s six-run outburst and was highlighted by a two-run blast off the bat of Ehire Adrianza. Adrianza joined the River Cats this afternoon as he continues his rehab for a broken foot and wasted no time getting comfortable, driving the first pitch he saw out to left. Overall, the switch-hitting shortstop went 3-for-5 with two RBI. In 10 rehab games, Adrianza is hitting .368 (14-for-38) with six home runs, 13 RBI and 10 runs scored between San Jose and Sacramento. Hunter Pence also made his 2016 River Cats debut tonight, going 1-for-4 with a double in six innings. The two-time World Champ and two-time All-Star is working his way back from hamstring surgery and in three games with the River Cats is hitting .500 (4-for-8) with two doubles, a home run, and an RBI. Austin Slater homered for the River Cats, his fourth, as did Andrew Susac, his eighth. Since returning from the All-Star break, the two have combined to hit .299 (20-for-67) with seven home runs, 15 RBI and 16 runs scored. Juan Ciriaco and Rando Moreno each drove in a pair and Kelby Tomlinson was 3-for-5 with two runs scored. As a team, the River Cats racked up 19 hits, matching their third highest total this season. Behind an explosive offensive performance, the bullpen quietly put together an excellent outing, led by spot-starter Austin Fleet. Fleet got the start after throwing just two days ago in San Jose and went three scoreless innings, giving up two hits and a walk while striking out two. The Chihuahuas entered this series with a PCL-best .314 team batting average while scoring over six runs per game. In their last 18 innings against River Cats pitching, though, the Chihuahuas have pushed just three runs across while generating 15 hits. Tonight, Fleet combined with Alex Torres, Duke Welker, Matt Reynolds, and Jake Dunning to hand the Chihuahuas their third shutout loss of the season. The River Cats and Chihuahuas will play two tomorrow to close out this series. Left-hander and PCL wins-leader Ty Blach (10-5, 3.70) will take the mound for game one against El Paso’s Aaron Northcraft (4-0, 4.46). Game two, which will start a half hour after the end of game one, features two bullpen arms going head to head. River Cats reliever Vin Mazzaro (2-1, 2.64) will take on Eric Yardley (2-0, 4.91). Both games can be heard live online at rivercats.com. New Orleans, LA – The Sacramento River Cats (43-56) ended their eight-game road trip on a high note Thursday night in New Orleans, defeating the New Orleans Zephyrs (46-50) by the score of 5-4. The win not only earned the River Cats their sixth series win, but brought their record to 5-3 since the All-Star break thanks to some familiar faces. Making his second rehab start with Sacramento was right fielder Hunter Pence, who suffered a setback in his last appearance July 16 against Round Rock. The San Francisco Giants star seemed no worse for wear, proving he was raring to go by launching a solo home run in his first at-bat of the game. The home run was Pence’s first with Sacramento since May 12 of last year. The three-time All-Star was not done either, as Pence smacked a double in his next at-bat to leadoff the fourth inning before coming around to score. The right-handed slugger finished the night 2-for-3 with a RBI and two runs scored before being replaced in right field by veteran Chris Denorfia. Not to be outdone was fellow fan-favorite Andrew Susac, who mashed his second home run in as many games in the winning effort. The talented backstop continued his hot hitting tonight, going 2-for-5 with two RBI and two runs scored. The Roseville-native showed off his defensive skills behind the dish as well, picking off Zephyrs’ catcher Tomas Telis to end the sixth inning. 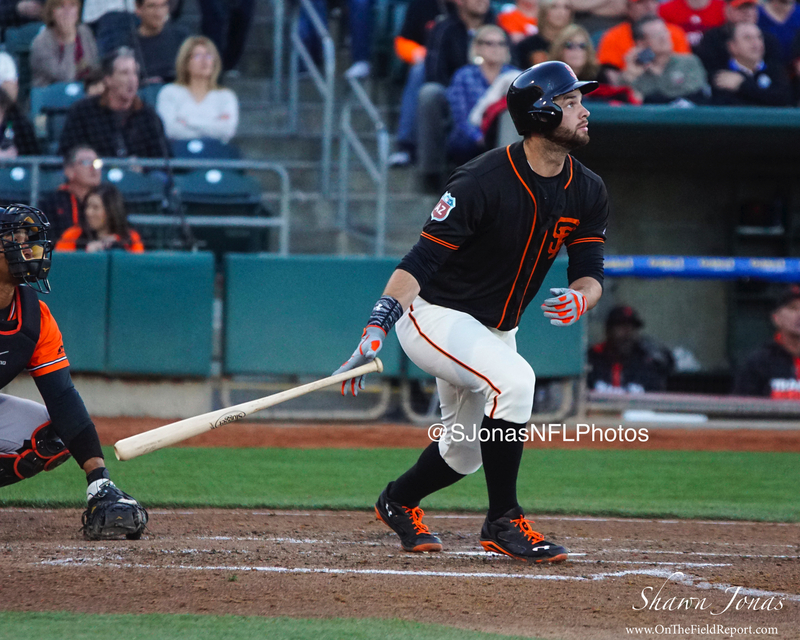 Tonight marked Susac’s second time this month in which he has hit home runs in consecutive games and the fifth time in his last 10 games in which he has gone yard. The right-hander has been locked in at the plate this month as a whole, leading the team in RBI (13) and runs scored (11). Right-hander Chris Stratton took care of the rest for Sacramento, putting forth another solid outing while picking up his seventh win in his last 10 starts. A native of Tupelo, Mississippi, Stratton went six innings, allowing three runs (one earned) on seven hits while striking out four and didn’t allow a walk. Over his last three starts, Stratton has struck out 20 of the last 76 batters he has faced. Jean Machi made things interesting in the ninth as he allowed one run before striking out Xavier Scruggs with the bases loaded to end the game. The save was Machi’s fifth with Sacramento and third on the road trip. The River Cats will fly home to the friendly confines of Raley Field to open a four-game set against the El Paso Chihuahuas this weekend. Sacramento will send lanky right-hander Joan Gregorio (2-6, 5.92) to the mound and El Paso will counter with their own righty in Michael Kelly (5-0, 3.23). First pitch is set for 7:05 p.m. (PT) and can be heard live online at rivercats.com. Round Rock, TX – Chris Stratton brought the Express offense to a halt Saturday night, dominating game three of the series and setting a new career-high in strikeouts. The right-hander, with the support of his closer and just enough offense, lifted the Sacramento River Cats (40-54) to a 3-2 victory over the Round Rock Express (47-47). In his first road start back with Sacramento, Chris Stratton proved his Major League abilities on the mound. The starter made a complete one-eighty from his previous start against Round Rock on August 18, 2015 in which he gave up three runs on four hits across four innings of work while walking four. Tonight, he managed seven strikeouts in the first four innings alone and finished with a career-high 12 strikeouts. He allowed just one run on three hits across his eight innings while walking one. While Stratton seemed to be in control on the mound, his offense struggled to give him the key hit to break the game open. The Sacramento bats were steaming all night with nine hits through the first seven innings but were kept to just one run. Overall, they picked up 13 hits on the night, but left 12 men on base and were just 2-for-13 with runners in scoring position. Through the first six innings of the night, the only scoring managed by either side came by way of the solo home run. The Cats were the first to strike in the fourth inning with a long shot by Austin Slater on an 0-2 pitch over the left-centerfield wall. The Express responded though, in the fifth, with a solo homer of their own off the bat of Joey Gallo. The clutch hit from the River Cats finally came in the eighth inning with the bases loaded and one out. Gorkys Hernandez, the team-leader in RBI, banged a single out to left field, scoring Slater and Travis Ishikawa to break the tie and put the Cats up 3-1. However, it was Jean Machi who saved the win for Stratton. Steven Okert took over in the ninth looking to close out the game, but gave up a run on three consecutive doubles and left with the bases loaded with one out. He handed the ball to Machi, who slammed the door shut and picked up his fourth save on the year by leaving all three Express runners stranded for the 3-2 win. 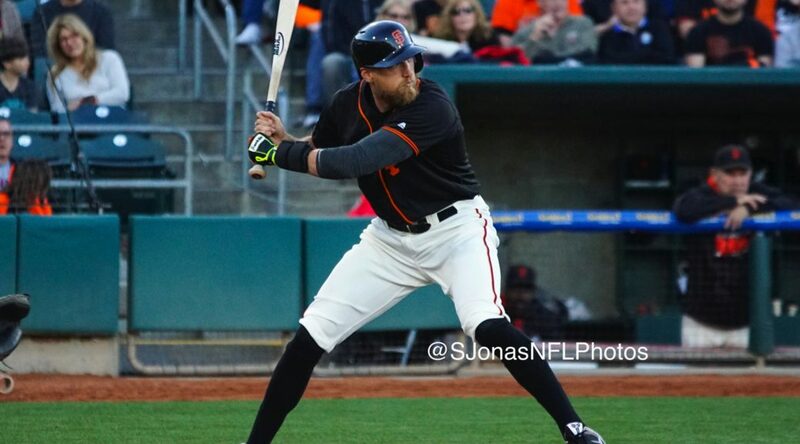 San Francisco Giants favorite Hunter Pence, who joined the River Cats on a rehab assignment this afternoon, logged two at bats before turning the right field reigns over to Ryan Lollis. The first pitch to Pence struck his left leg in the first inning, and then he singled in the third before being lifted for a pinch runner. The right fielder is tentatively scheduled to rehab with Sacramento for about a week as he recovers from a torn hamstring he suffered at the beginning of June. Sacramento will send the tall right-hander Joan Gregorio (2-5, 5.63) to seize the series finale tomorrow night. Opposing him will be Round Rock’s right-hander Chi Chi Gonzalez (3-6, 4.98). First pitch is set for 5:05 p.m. (PT) and can be heard live online at rivercats.com and on the air on ESPN 1320. 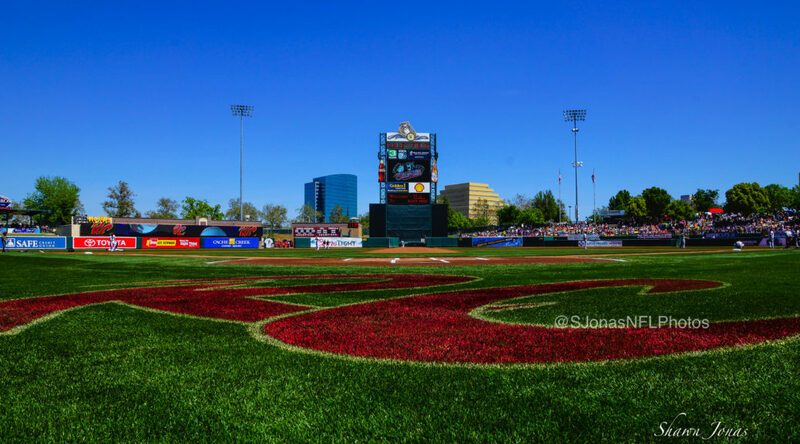 WEST SACRAMENTO, CA – The fans painted it black and orange at Raley Field Wednesday night, as the Sacramento River Cats hosted their major league affiliate in the first ever Exhibition Game between the River Cats and San Francisco Giants. In front of a sellout crowd, the River Cats fell 8-4 to their big league rivals. 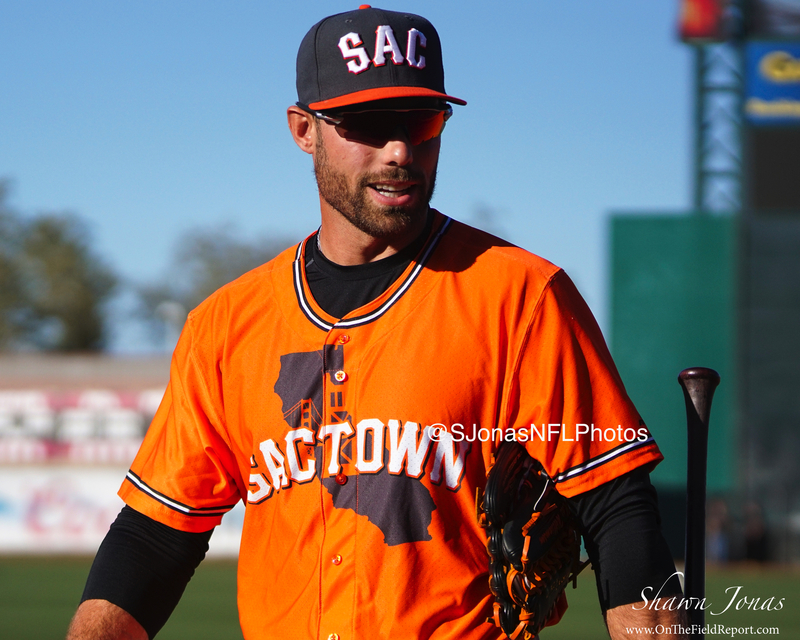 The orange and black wasn’t just present in the stands, as the River Cats used the historic game to debut their all-new orange Sactown jerseys. These jerseys – which feature both the Tower and Golden Gate bridges – will be worn at all Friday home games starting this season. The Giants brought the black with their solid black 2016 Spring Training jerseys. It was more than just matching colors on display, though, as the Giants put out a lineup that closely resembles what fans can expect in San Francisco on Opening Day. Buster Posey, Hunter Pence, Brandon Belt, Brandon Crawford, Sergio Romo, and more headlined the Giants Exhibition lineup. Posey, Crawford, and Belt each hit a home run and combined to go 5-for-10 with four runs scored and five RBIs. On the mound for the Giants it was Johnny Cueto, George Kontos, Sergio Romo, and Santiago Casilla. 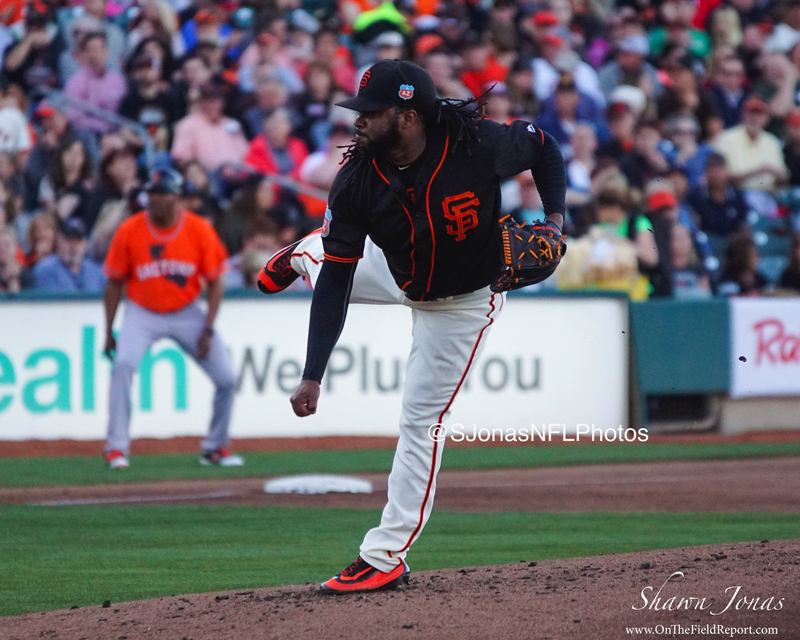 Cueto picked up his second win of the spring while Romo and Casilla combined for a perfect eighth and ninth inning. Opposite them, the River Cats introduced Sacramento to their 2016 roster, including fan favorites Jarrett Parker and Mac Williamson. Newcomers Gorkys Hernandez and Hak-Ju Lee were impressive in their Sacramento debut, as well. Hernandez was just 1-for-4, but was aggressive on the base paths and nearly made an incredible catch, almost robbing Belt of a home run to straight-away center. Lee set the pace for the offense, launching a two-run home run to start the scoring for the night and reaching base three times. Chris Stratton got the nod for Sacramento, making his first start at Raley Field since September 4, when he struck out eight in six innings of work. He went four innings and allowed four runs on seven hits in tonight’s game. Stratton was followed by lefty Matt Lujan, who went the rest of the way for Sacramento and surrendered four runs on six hits. The River Cats are back in action on Thursday, April 7 as they travel to Salt Lake to open their season against the Bees. The home opener is scheduled for Friday, April 15, also against the Bees. 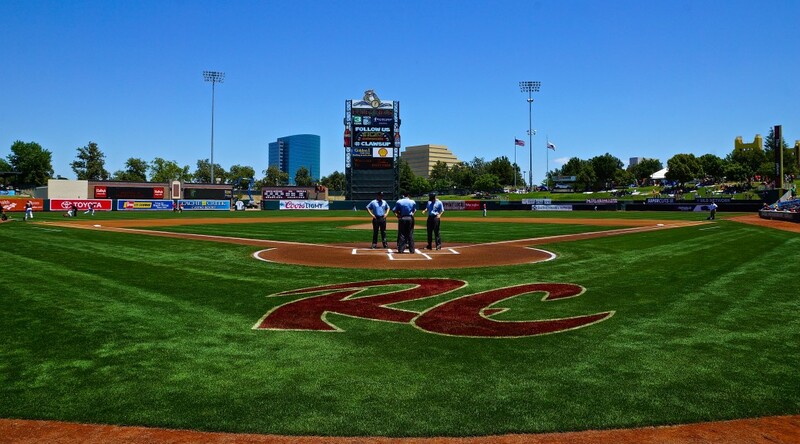 WEST SACRAMENTO, CA –The Sacramento River Cats and San Francisco Giants have announced an extension of their Player Development Contract (PDC). The extension is for four years, keeping the Giants’ Triple-A affiliate in Sacramento through the 2020 season. 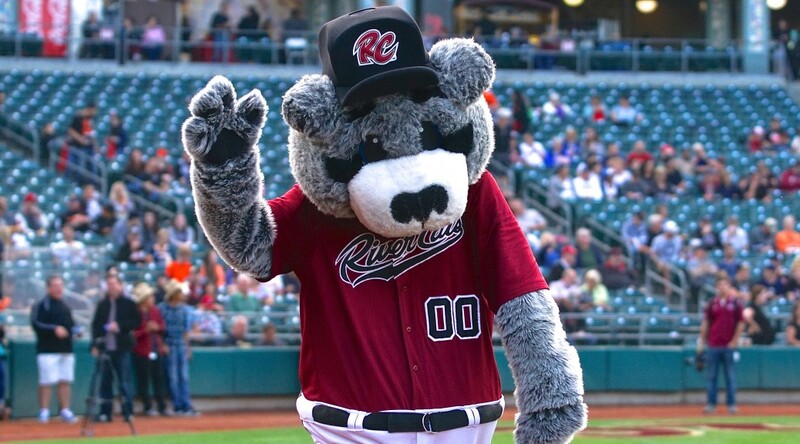 River Cats General Manager Chip Maxson will make the official announcement at today’s Preseason Party at 12:30 p.m. in front of loyal fans at Raley Field. The Giants originally entered into a two-year PDC agreement with the River Cats in September of 2014. With this extension, the two teams will remain affiliated through the 2020 season. Despite entering just their second season as the Giants’ Triple-A affiliate, the River Cats have already seen their fair share of players entering into the Major Leagues. Trevor Brown, Josh Osich, Kelby Tomlinson, and Jarrett Parker headlined a group of nearly fifteen players who put in time with both the River Cats and Giants. Conversely, a number of Giants made their River Cats debut in 2015 on rehab assignments, including Hunter Pence, Matt Cain, Joe Panik, and more. Sacramento is one of San Francisco’s five domestic minor league affiliates, joining Double-A Richmond (Eastern League), Advanced-A San Jose (California League), Class A Augusta (South Atlantic League) and Short-Season A Salem-Keizer (Northwest League). WEST SACRAMENTO, CA – The Sacramento River Cats are excited to announce the official on-sale date for tickets to the March 30 Exhibition Game between the River Cats and three-time World Champion San Francisco Giants. Tickets will go on sale to the public on Sunday, March 6 at the River Cats’ Preseason Party and official Ticket Office opening. An exclusive presale will be made available to River Cats Season Ticket and Mini Plan members. For more information, please visit rivercats.com, send an email to tickets@rivercats.com, or call the River Cats Ticket Hotline at (916) 371-HITS (4487). Sunday, March 6 is the official opening of the Raley Field Ticket Office as well as the River Cats’ Preseason Party. Fans are invited to Raley Field to enjoy a day at the park, including free ballpark snacks, clubhouse tours, batting practice, ticket/seat selection, and more. March 30’s contest will be the first between the River Cats and Giants. The game will allow local fans an opportunity to see not just their favorite River Cats players, but also current members of the three-time World Champion San Francisco Giants. Three-time All-Star Buster Posey and World Series MVP Madison Bumgarner are expected to take the field alongside fan-favorite Hunter Pence and Gold Glove winner Brandon Crawford.